Jack Holder spearheads the Panthers four. Panthers team manager Carl Johnson is backing Jack Holder to be the star of the SGB Championship Fours for the second successive year. The Australian ace was the main man behind Plymouth’s success in the annual event at the East of England Arena last summer. Now Holder will spearhead Panthers’ own challenge for glory in the 2017 staging when the leading lights from all 10 second-tier clubs do battle on Sunday (2pm). He is joined in the city quartet by former British champion Chris Harris, Paul Starke and captain Ulrich Ostergaard. Bradley Wilson-Dean is reserve. “Jack was the star rider of the Fours last year,” said Johnson. “I think I’m right in saying he only dropped a couple of points all weekend for Plymouth. “That showed us how much he loved our track and was a big part of our thinking when we brought him to the club. He’s been a terrific signing and hopefully he can put in another top performance in the Fours. Panthers have competed in the Fours three times since returning to the second tier of the sport. They bowed out at the semi-final stage in 2014 and 2015, before only managing third place last year when receiving a bye straight into the final. They’re hoping for better this time around as they bid to mark the anniversary of the club’s first-ever trophy – gained in what was known as the National League Fours back in 1977 – in style. The five riders involved in that inaugural triumph – Ian Clark, Kevin Hawkins, Andy Hines, Nigel Flatman and Brian Clark – are all set to be present on Sunday. Flatman has travelled over from Australia. Johnson added: “It is great to have the guys who won the club’s first piece of silverware in attendance – and it’s a chance for our current riders to put their own names into the history books. “There’s no doubt in my mind that we are good enough to win it, but virtually every other team will think they can do it. Panthers feature in Group A along with Edinburgh, Sheffield, Workington and Scunthorpe. Glasgow, Ipswich, Newcastle, Redcar and Berwick form Group B with the top two in each section going into the final. 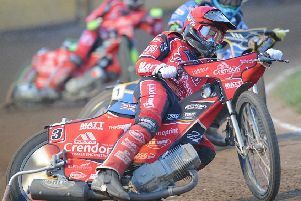 Holder delivered another demonstration of his talent when making a stunning debut in the Polish Ekstraliga last Sunday. He piled up 13+3 points for Torun in a defeat at Leszno. PETERBOROUGH: Jack Holder, Chris Harris, Paul Starke, Ulrich Ostergaard (reserve: Bradley Wilson-Dean). EDINBURGH: Sam Masters, Erik Riss, Ricky Wells, Theo Pijper (reserve: Josh Pickering). SHEFFIELD: Josh Grajczonek, Josh Bates, Kyle Howarth, Lasse Bjerre (reserve: Todd Kurtz). WORKINGTON: Craig Cook, Ty Proctor, Thomas Jorgensen, Mason Campton (reserve: Matt Williamson). SCUNTHORPE: Michael Palm Toft, Lewis Kerr, Ryan Douglas, Josh Auty. GLASGOW: Richard Lawson, Aaron Summers, Ricky Worrall, Nike Lunna (reserve: Dan Bewley). NEWCASTLE: Robert Lambert, Steve Worrall, Stuart Robson, Ludvig Lindgren (reserve: Ashley Morris). IPSWICH: Danny King, Rory Schlein, Cameron Heeps, Kyle Newman (reserve: Justin Sedgmen). REDCAR: Jason Garrity, Charles Wright, Ben Barker, Jonas B Andersen (reserve: Ellis Perks). BERWICK: David Howe, Jye Etheridge, Kevin Doolan, Dany Gappmaier.